"Really? You're who she picked?" Malborn is a Bosmer servant who becomes a crucial informant for the Blades. 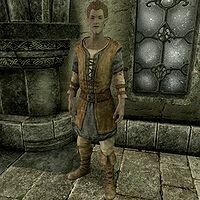 He is initially found in Solitude during the Diplomatic Immunity quest, offering to smuggle your equipment into the Thalmor Embassy, where he will return for your subsequent infiltration. However, he is inevitably caught and, depending on your actions, can either be killed or escape the Embassy. 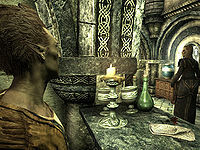 If he survives the quest, he can be found in Windhelm, inside New Gnisis Cornerclub, angrily berating you and Delphine for ruining his life and turning him into a fugitive. From this point, he will ask you to kill a Thalmor assassin waiting for him outside of the city gates, so he may safely escape to Morrowind. As you will find out, Malborn is not even close to a warrior and carries no weapons. He only owns a set of regular farm clothes, a pair of boots, and a selection of common items and gold. After the events in Kynesgrove, a concerned Delphine will suspect that the Thalmor are behind the return of the dragons. She will ask you to meet her back in Riverwood where she will tell you her plan to infiltrate the Thalmor Embassy: "The Thalmor ambassador, Elenwen, regularly throws parties where the rich and connected cozy up to the Thalmor. I can get you into one of those parties. 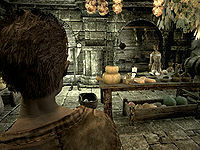 Once you're inside the Embassy, you get away and find Elenwen's secret files. I have a contact inside the Embassy. He's not up for this kind of high-risk mission, but he can help you. His name's Malborn. Wood elf, plenty of reason to hate the Thalmor. You can trust him. I'll get word for him to meet you in Solitude, at the Winking Skeever -- you know it? While you're doing that, I'll work on getting you an invitation to Elenwen's little party. Meet me at the Solitude stables after you've arranged things with Malborn. Any questions?" She will then readily spill Malborn's motivations for helping you: "Don't worry about Malborn. He's not a dangerous character like you, but he hates the Thalmor at least as much as I do. 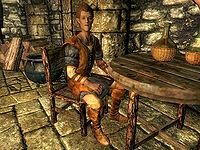 He's a wood elf - the Thalmor wiped out his family back in Valenwood during one of their purges that we never hear about. Luckily they don't know who he really is, or he wouldn't be serving drinks at the Ambassador's parties." She will then explain about the distraction you will have to cause to get unnoticed into the private quarters of the Thalmor Embassy and finish with: "Then you'll need to find Elenwen's office and search her files. Malborn should be able to point you in the right direction." 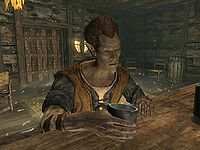 At The Winking Skeever in Solitude, Malborn will now be among the regulars, although he sits in a dark corner and keeps to himself. When you tell him that Delphine sent you, he will reveal how scared he is about the upcoming infiltration: "Really? You're who she picked? I hope she knows what she's doing. Here's the deal. I can smuggle some equipment into the Embassy for you. Don't plan on bringing anything else in with you. The Thalmor take security very seriously. I'm ready to go. Give me what you can't live without, and I'll make sure to get it into the Embassy. The rest is up to you." If you ask him what kind of stuff you should bring to the party, he will get upset again: "You're asking me? She promised that she was sending someone who knew what they were doing... If you actually want to get out alive, I'd bring whatever you need to move quietly, and kill quickly." If you ask for a bit more time to prepare, he will respond: "I'll give you a few more minutes. I can't wait here all day. It's my neck on the line, remember." When you are ready, tell him, and he will say: "Okay. I'll get this inside the Embassy for you. I've got to go. I'll find you at the party, don't worry." You can then hand him the most necessary equipment and he will get up and leave the Winking Skeever. If you approach him on the way he will remind you: "Your job is to get into the party without being fingered as a spy. I'll take care of the rest." He then walks all the way to the Thalmor Embassy, a trip that takes him four in-game hours, and a few feet away from the entrance, waiting for you to meet Delphine. After that, Elenwen will go away and you can talk to Malborn as planned: "What can I get for you? You made it in. Good. As soon as you distract the guards, I'll open this door and we can get you on your way. Let's hope we both live through this day." If you order a drink from him, he will say: "Here you go, sir/ma'am. The finest Colovian brandy. Is there anything else I can get for you?" If you tell him you are ready he will keep up the act: "Of course. Let me see if we have another bottle of that. I'll be waiting by the door for everyone to be distracted." If you ask him for another drink he will say: "We seem to have run out of Colovian brandy. I'll check in the wine cellar for more when I get a moment." Still, he will stay behind and wait for you to create a distraction. "Tss! Get out of here, I saw nothing." With Tsavani silenced, Malborn turns to you: "Your gear is in that chest. I'll lock the door behind you. Don't screw this up. I need to lock the door behind you or the patrols might notice something's wrong." If you spend too much time, he will get impatient: "Hurry it up. I've got to get back before I'm missed." and "Come on. If someone misses me at the party, we're both dead." As soon as you enter the private quarters of the Embassy, Malborn will lock the door to the kitchen and leave the rest of the infiltration to you. Later on, in the interrogation chamber where Rulindil questions Etienne Rarnis on the whereabouts of Esbern, you will meet Malborn once again, although in a very precarious situation. 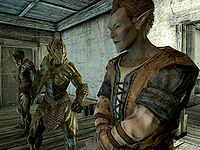 He has been caught by the Thalmor soldiers, and one of them will shout: "Listen up, spy! You're trapped in here, and we have your accomplice. Surrender immediately or you both die." Malborn, as nervous as ever, will just shout: "Never mind, I'm dead already-", but the guard will interrupt: "Silence, traitor! Move. Slowly." On the northeastern balcony, you will see the two guards slowly moving towards the stairs with a helpless Malborn between them. Both guards will attack you right away, and Malborn will attempt to help you out using his fists; he can easily die during the battle. If he survives, he will show his usual paranoia, saying: "Now the Thalmor will be hunting me for the rest of my life. I hope it was worth it. ", "I should have known this would end badly. I can't believe I let Delphine talk me into this." or "Let's get out of here, for pity's sake!" At this point, Malborn will be a temporary follower, although you will have to look after him as he is no good in battle. Escape through the trap door into Reeking Cave and fight the troll, then locate the exit. Once outside, the paranoid Malborn will set off at a running pace, so scared that he will run all the way to Windhelm and check in at New Gnisis Cornerclub in the Gray Quarter. This ends his involvement with Diplomatic Immunity, and he will be forever wanted by the Thalmor due to his deeds. Fortunately, you will get the chance to help him escape from Skyrim if you go to Windhelm and enter the cornerclub. "I count my blessings every day." In New Gnisis Cornerclub, Malborn will spend all of his time in the taproom, too scared to venture outside and too scared to sleep. Once you enter, he will immediately say: "Oh, it's you. I didn't expect to see you again." You will have three options, all of which net you a bitter reply. If you tell him it is good to see him again, he will remark: "Trying to stay ahead of the Thalmor assassins. I'm not a hero like you. I don't stand a chance." If you tell him he should be grateful he is alive, he will answer ironically: "I count my blessings every day." If you tell him that he should be angry at Delphine for putting him in such a tight spot, he will answer: "Don't worry, I'm mad at her, too. And at myself for ever agreeing to get involved in her insane scheme." When asked what he is doing in Windhelm, he will explain: "Trying to stay alive. I think time's running out though. I'm pretty sure the Thalmor know where I am. Maybe you can help me. You know, by way of making amends for getting me into this mess." You can reject his plea and get an understandably bitter response: "Sure, fine. Thanks for nothing. You already got what you needed from me." If you accept to help, he will be grateful and explain the situation: "You will? Really? Well, okay, here's the situation. I was trying to get to Morrowind. The Dunmer don't care much for the Thalmor and I figured I'd be safe there. As safe as anywhere, that is. But there's a Khajiit hanging around the main gate. I didn't like the way he was looking at me. I'm sure he's Thalmor. Just waiting for me to leave so he can follow me and kill me in a lonely place." You will have two options, either tell him he is paranoid or offer to help him right away. The former will make him say: "No, you can't ever be too paranoid where the Thalmor is concerned. Look what happened to the Blades. The Blades! If the damn Blades are no match for the Thalmor, what chance do I have? Please, just go check it out. You'll be saving my life." The latter option will make him apologize for his behavior: "You'd be saving my life. Again. I know I probably seemed ungrateful... I've just been so scared. Expecting a knife at my throat any minute." Near the Windhelm Stables, a Khajiit caravan will have settled down, although one of the Khajiit doesn't act as casual as the others. After speaking to Ri'saad, approach J'datharr and tell him that Malborn has a message from him. This will cause him to say: "Malborn? Ah... very good. I think we understand each other." He will then draw his weapon and attack, so kill him and read the note he is carrying, clearly a message from the vengeful Thalmor. Return to Malborn who will be grateful: "That's... great news. I'd... I'd better go. Right now. Before they find me again. This is my chance. Thank you! Here... I stole a lot from the Thalmor over the years. You may as well have some of it." He then hands you some gold and gets out of his chair, exits New Gnisis Cornerclub, and runs all the way to the Morrowind border at Refugees' Rest, where he will disappear from the game. When you hand Malborn your belongings inside The Winking Skeever, you are actually handing them to a different version of Malborn, in the game data referred to as MQ201FakeMalborn, an NPC that is hidden in a testing cell, to which you have no access by normal means. Malborn is essential until stage 220 of Diplomatic Immunity. The stage appears to be empty, but contains the codes to set up the hostage situation in the interrogation chamber. This page was last modified on 23 September 2017, at 17:03.